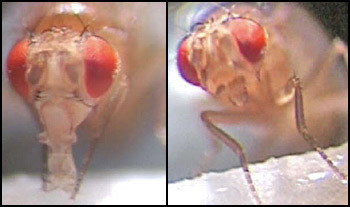 Fruit flies love sugar solutions, and will readily slurp it (left). However, when their favorite punch is spiked with L-canavanine, the fruit flies retract their proboscises, thereby avoiding the toxin (right). Fruit flies are small, innumerable and too dumb to appreciate locally sourced slow food, although they do savor slightly spoiled culinary masterpieces in heaps of compost and garbage. But for flies to remain among the living, and produce young, they must be able to taste their food to avoid toxic chemicals. This tasting occurs at "gustatory receptors" that resemble the chemosensory neurons located on our tongues, which similarly detect chemicals in food. This week, an entirely different type of fruit fly taste receptor was pinpointed by a lab in France, where a group led by Yves Grau has identified the first taste receptor gene that is not related to the 68 gustatory receptor genes that the fruit fly seems to contain. 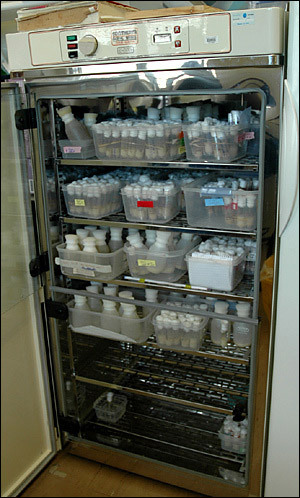 Each tube in this incubator contains hundreds of flies of a particular strain. You thought it was their cute looks, but low maintenance and sheer numbers make fruit flies practical for genetic research. The new receptor, which can detect a common toxic chemical found in plants, is made by a gene called DmXR. DmXR, in turn, evolved from a gene that detects glutamate, a neurotransmitter that carries signals among neurons. The finding suggests a newfound capability and diversity for the fly's all-important sense of taste. Over hundreds of millions of years of evolution, plants have evolved thousands of bitter, toxic compounds in order to prevent animals from eating them. These compounds can be useful: the anti-malarial medicine quinine comes from the cinchona tree. And caffeine has helped the coffee tree achieve worldwide distribution, and is a primary energy source at places like The Why Files. Many legume plants (the large family that includes peas and beans) contain L-canavanine, an amino acid that can substitute for its close structural relative, L-arginine, to make proteins that fail to do their jobs. Among fruit flies, L-canavanine has second-hand toxicity: adults survive if they eat it, but their larvae die. That's a powerful evolutionary force that has caused the flies to steer clear of L-canavanine - and the plants that make it. Until now, nobody knew how flies avoided this common toxin, which is not detected by any of the taste receptors made by known gustatory receptor genes. Now Grau's group has identified the receptor that allows the fly to shun food containing L-canavanine, and found that it is created by a gene that once had an entirely different purpose: "listening" to nerve signals. 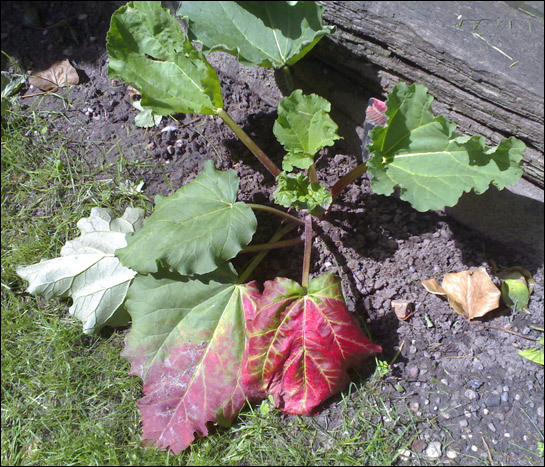 Rhubarb leaves contain poisonous substances like oxalic acid, yet their stalks make a dynamite pie. Animals gain a powerful selective advantage from distinguishing toxic parts from nutritious ones. Mutant fruit fly: A tasteless arthropod? Placing the DmXR gene in cells in a lab dish and showing that they respond to L-canavanine, but only when the gene was intact. Proving that fruit flies with an intact DmXR gene would shun sugary drinks containing L-canavanine. However, flies containing a mutated gene, which made a defective receptor, did drink those drinks. Blocking DmXR's function with a bit of RNA, which allowed the flies to drink L-canavanine-containing sugar water. Noticing that the flies retracted their mouth parts, ending any possibility of feeding, when water containing L-canavanine was daubed on their legs. (Fruit flies, who were never warned against playing footsies with their food, have taste detectors on their legs). 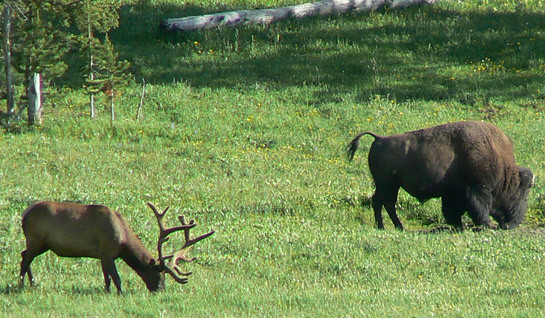 With all the toxic plants out there, how do herbivores like these elk and bison know what they shouldn't eat? Some animals can detoxify chemicals, but many also avoid food with a nasty taste! Practically, a better understanding of how insects avoid toxics could be instrumental in battling bugs that spread destruction and disease in animals and plants alike. But the new study also reiterates that evolution does its inventions through an endless process of trial and error. Like a backyard mechanic who uses a car's water pump to irrigate the garden, evolution responds to necessity by repurposing what's on hand to meet the challenges of the moment, including survival, reproduction and avoiding toxic food. • Are gross tastes the origin of emotional disgust? • Why does orange or grapefruit juice taste so nasty after brushing my teeth? • Mitri C, Soustelle L, Framery B, Bockaert J, Parmentier M-L, et al. (2009), Plant Insecticide L-Canavanine Repels Drosophila via the Insect Orphan GPCR DmX.